Lately I have been thinking a lot about mixing breeds for our new dog sports like flyball, agility, etc. The practice of mixing breeds is frowned upon by many in the dog world. A couple of weeks ago I was talking with a gal who raises Staffy Bull Terriers. She shows them in breed and dabbles in some sports. I asked her if she ever did flyball. She looked down her nose at me and gave me a look of pure horror and exclaimed that she HATED flyball. I asked her why. There was a time in my life when I bought into the thinking that the only dogs that should be bred have registration papers. I no longer feel that way. There are responsible breeders who mix breeds and irresponsible breeders who mix. There are responsible breeders who only breed same breed to same breed and irresponsible breeders who only breed same breed to same breed. Why was it OK to develop breeds for hunting, herding, swimming, protection, etc. but NOT OK to breed dogs specifically for the sports we have today? I honestly don’t get that mentality! If a breeder does appropriate testing and background health checks on sires and dams and makes sure the puppies get the best homes possible, why is that any worse than breeding papered dogs? I know that most Poodle breeders HATE Labradoodles. I have to admit they are not my favorite, and I have to wonder how much background and health testing are done with these dogs. I am also not a Lab type person. I am not into dogs that drool and pant. I used to raise Great Danes and they are the kings of drooling and panting. I like the dry mouth Poodles and Border collies we now have. What was the cutoff date for creating new breeds or mixing to create a great dog for any purpose? Was it 1860 or 1900 or 1920 or 1935…? Why is mixing dogs for agility or flyball or any other activity we want to share with our best friends, a horrible thing? How are the breeding dogs kept? Do they have high quality food, a great place to live, are not stuck in crates most of the day and have a person or persons to love? Does the breeder “vet” the buyers to give those pups the best chance at a wonderful life or do they take them to the local grocery store and hand them to folks? I know a lot of “purebred” breeders who house their dogs in kennels all day and the only time the dog sees anyone is at feeding or kennel cleaning time. They thump their chests about people NOT mixing breeds but their dogs have HORRIBLE lives! Sure, there are people who mix breeds and keep their dogs in crate and/or kennels all day too. However, there are responsible breeders on both sides as well. I know that most “purebred” breeders are now thinking I am going to straight to mixed breed hell when I die! I know many of the die hard show breeders already call me “a nut” for my views on structure and performance. Most have had little or no exposure to high level performance dogs. I love our Poodles and I love our Border collies. I would really love to breed one of our Poodles to a Border collie. I think it would make an awesome combination! Why? I love training both breeds, but much prefer trialing the Poodles over the BCs. I LOVE the structure on many working BCs. It is much better than Poodles of today. 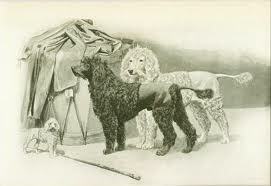 The original Poodle had lovely working structure but, alas, the fads and fashion of the show ring have ruined that! I won’t even get into the health issues created from all the line and inbreeding to “fix type” on show dogs! I love the sense of humor of the Poodle and the abilities (mentally and physically) of the BC. Certainly, the Poodle structure could only be helped by breeding to a well built, great working BC. But the BC needs a little lightening up in the personality department for me. They are fine the way they are for working sheep, cattle, or whatever they are asked to do! I am NOT looking to improve on the BC, just add a sense of humor to match my personality. If I could find a Poodle with great working structure like they had originally, I would be all over that! Sadly, they no longer exist. 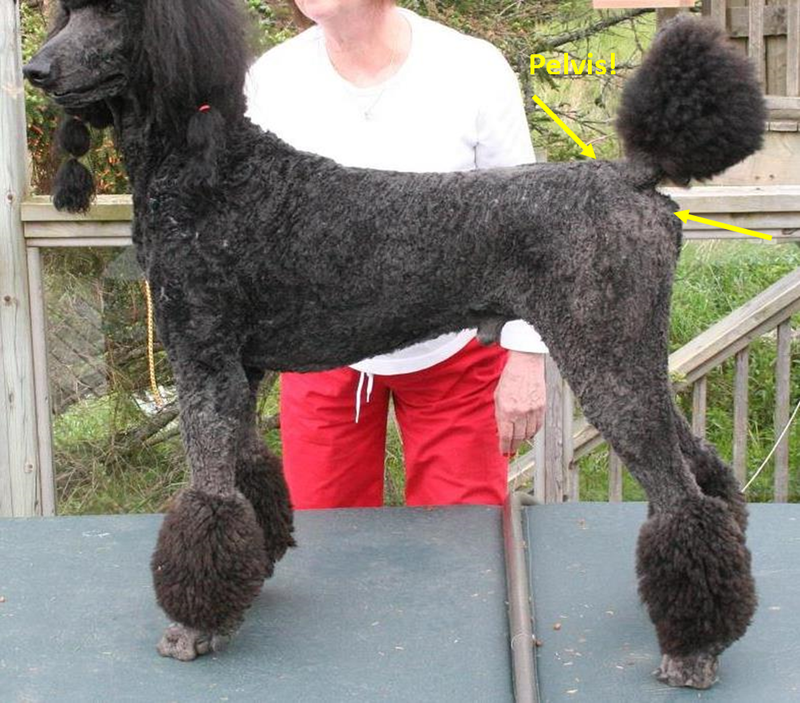 The early Poodles had great LONG pelvises and good properly constructed fronts. They had long bodies and short backs. Their heads did not come out of the same hole on top of the back as their tail. They were much more than the high headed, high tailed, high prancing coat racks seen winning in the show ring today. Many of today’s Poodle temperaments stink along with their structure and most wouldn’t get caught dead in the water! Yes, there are exceptions so don’t write to me telling me I am all wrong because your uncle Joe had one once. Early Poodles below. Note the long pelvis and proper tail set, not the 12 o’clock tail set so prized today! Look where those front legs fall! They are BEHIND the neck. If a Poodle had the correct structure of the original working Poodle of a hundred and fifty years ago, they wouldn’t get a look in the show ring by today’s standard! That is just plain sad. The show ring has not improved the Poodle or any other breed for that matter. They have turned most into caricatures of their former selves. How is that an improvement? 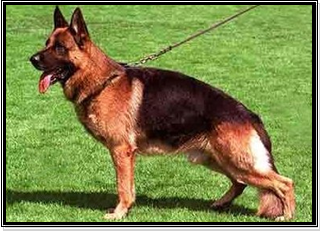 Go look at the original German Shepherd Dog or the original Bulldog or any other breed bred for a specific task. They look NOTHING like the overdone, grotesque show dogs that are so prized and precious today. Will I do the mix of a Poodle to a Border Collie? Probably not. I am too conditioned to think that would be a very bad thing. But is it? REALLY? I am a little late to this forum I have been recovering from surgery, but I sure get a good laugh when I read your blog. I show standards in agility and am somewhat new to having such great fun. I have often said for fun lets breed Irish SP with Flynn a border collie and we will have a great agility dog. I don’t really mean it but I truly wonder what would happen? 50 years ago when I was a teenager I showed in conformation and did unbelievable well; so I have seen both sides of the fence. I went to a. conformation show recently and was shocked how the breed I showed(Maltese) had changed. They have no bone anymore, I guess in their quest to breed little dogs they lost the stamina and strength that our dogs had 50 years ago. And she was a little Maltese but she had bone. Let me know if you ever see a SP Border mix. OK, I think I am qualified to weigh in on this based on that I have a “goldendoodle” and am getting a standard poodle puppy later this year. Helen we talked a little last month and I hope we can meet again when you are done with your treatment. I think the problem even if you could find a good mixed poodle breeder (and I do think there are some) you are getting 50% of each breed of dog and I don’t think you can select for that. If you love a GR and SP you are in great shape but you aren’t going to be able to select for what you want with purebred BC to SP and you could get temperament of BC. I think what you do get in the F1 is the hybrid vigor because the pedigrees are unrelated. The poodle people don’t want to acknowledge this but at least they have cut the COI way down with this. BTW I love my dog and did not do enough checking when I got her but what I am hoping to improve on is a more bulletproof dog, not so environmentally sensitive, but I really want a good swimmer and that will be harder as my dog is a naturally excellent swimmer. When it comes to dogs and breeds, I am totally ignorant. However this describes my lab Chaos to a T ” I got her but what I am hoping to improve on is a more bulletproof dog, not so environmentally sensitive, but I really want a good swimmer and that will be harder as my dog is a naturally excellent “Which makes me curious about the differences between poodles and labs, other then structure. Your post reminds me of the wonderful Raymond Coppinger in two ways; first, his cross-breeding of the Husky and Border Collie to try to improve sled dogs, and secondly, his Kennedy-esque challenge that people should only have dogs if they can provide the dog with a good life. Hey, just found your blog through the ‘agility’ tag. I haven’t read through all the comments yet so sorry if this has been said already. I’ve been thinking a lot about crosses lately as an agility person myself, in Australia, and noticing that in the UK in particular, there seems to be a few people breeding Border-whippets. I love this concept if you can find the biddability/drive/trainability of a border collie, with some of that sighthound speed. You’d be unstoppable! Not many of them down here, though, and I don’t think I have the guts to branch out and do it myself (yet?). But certainly a great post, and something to consider why it’s such a bad thing to do crosses for a specific purpose, assuming you do all health tests, temperaments are good, etc. the ones I see at shows & at dog training are far more like your original type poodles. They are fit for purpose too – retired show dogs will happily hunt – try keeping a poodle on a diet when it can catch rabbits on the daily walk! Dogs are only as good as the genes that go into them. I don’t have an issue with a dog owner cross breeding to create a litter for a purpose, eg the Siberian Husky x Border collie favoured by some top obedience people here. I do object to puppy mills selling unhealthy dogs to unsuspecting buyers who naively believe a designer dog will be healthier because they have been misinformed about what hybrid vigour means. Perhaps if people did more research into breed traits they could find the one that suits them rather than expect a mix to magically combine the desired characteristics & none of the undesirable ones. I always wondered what ‘spoodle’ breeders did with the pups that turned out to have a spaniel coat & poodle personality… the reverse of what they claim the ‘breed’ to be. apparently I really don’t want to know. I did not know “Australian Labradoodle” was a unique breed? How are they different then Labradoodles all over the world? Sorry but that is just a odd phrase. If I got a standard poodle from Australia I would call it a standard poodle. Adding verbs to a dogs “pedigree” does not make it any better. The problem with the mixed breeds is the very high majority are not properly health tested or matched appropriately for producing sounds dogs; just a “desirable” package; I use that term loosely because I see nothing desirable about them. You might want to check into English vs American Cockers, Foxhounds, English vs Welsh Springers, the list goes on and on. You might also want to look into parts of speech- verbs are action words, and I have yet to hear a definition of Australia that implies an action, unless perhaps you are talking about the Australian Crawl swimming stroke. I see nothing desirable in many purebred breeds, which doesn’t mean they shouldn’t exist. And many purebred breeders don’t test, either, nor is testing a panacea for breeding. Use of popular sires and excessive linebreeding (especially in combination!) mean that many genetic disorders are more likely to occur in purebreeds, and some occur only in a particular breed. Yes this is considered far more “responsible” in spite of decreased lifespans compared to mixed breeds! BTW-the term “linebreeding” is also not recognized by the spellchecker, or, incidentally, by geneticists or other scientists. Wow! That picture of the Lab is amazing. The most awesome dog I have ever seen. Labs drool and then use poodle hair to soak up the slobber. That Lab was the best Lab I have ever seen in agility. He was as beautiful inside as outside and he loved Gramma’s big car ;). Hooray for this post! There are many more people who are finally seeing that crossing is no crime. It’s how many if not most of today’s breeds came to be. And it’s what will save many dogs from the follies of inbreeding and linebreeding, closed registries and so on. There are loads of breeds I love, but all the love in the world will not keep them from running into more and more genetic issues. Anyone who studies population genetics realizes that no creature was meant to stay exactly the same indefinitely. All species change with time. The only ones that don’t are the ones that die off. This reality has to be faced by breeders, whether they like it or not. The breeds they love may not come to a serious genetic bottleneck in their own time, but in the future they will, if they continue to see outcrossing or crossbreeding as such an extreme taboo. Dogs are whatever we want them to be. The boundaries we set are up to us. And BTW, that also means that “Mutt” only became a four-letter word because we perceived it that way, or that somehow it was definted as derogatory in OUR minds. I find it laughable that humans decided it was necessary to come up with the politically correct “All American” and so forth. Unless one of the dogs called and complained, which I highly doubt. Helen As a direct response to this entry, today in the middle of a discussion on your topic with a generally respected poodle person i think, I was told “real dog people” do not own labradoodles. They only own purebreds and rescues. Modern genetic knowledge used by innovative breeders will be what saves purebred dogs, like the folks who did the LUA Project for Dalmatians, an outcross done for the health of the breed. The cult of ‘pure blood’ inbreeding for over 100 years resulted in the entire breed having uric acid stone-forming disease. But now there is a way for them to breed for better health, because some folks were willing to look back into history and cross to a related breed (Pointer) to get healthy genes back into Dalmatians. This is what truely skilled dog breeders do — they intelligently select for traits, and health, and produce superior dogs. Worshiping some myth of ‘pure blood’ while your dogs fall apart or become obsolete in the modern world is stupid. 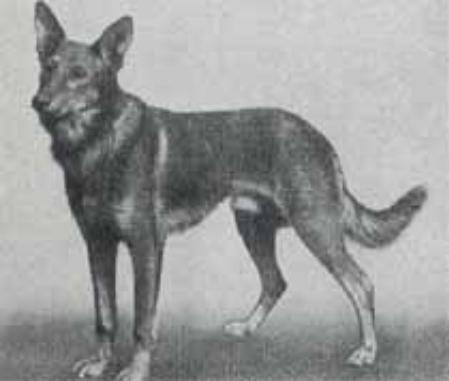 Look to every other purebred animal community outside of dogs (like cats, for example, where outcrossing for things like health or to improve certain features is allowed, and the offspring can be registered as pure again as long as they match the breed standard), and you”ll see just how backwards most purebred dog breeders are in comparison. Or heck, look at horses, where crossing for performance purposes is bog-standard and nobody bats an eyelash at it. Last I checked, there were still distinct horse breeds running around despite all those icky hoofed ‘mongrels’ running around! Helen, As a possible antidote to your prejudice: This is Stella (best dog in the world!) in class last week. Its just one little sample of all the various things we do with her, please take a quick look. She is an Australian Labradoodle from a breeder of healthy, tested, exceptional dogs in upstate NY. We (Stella’s people) are taking exception to your blanket turned up nose disapproval of all labradoodles and your blanket suspicions of all labradoodle breeders—as very likely not being responsible, doing any background and health testing—and not giving the serious breeders of these wonderful dogs the same break–that some are good, some maybe not so good–you give to other breeders here in your post. I am sure you adore your Stella and she looks like a fun dog. I prefer Border collies and Poodles. I am not a Lab kind of gal. I think they are fine dogs, just not for me. Poodles are not for everyone either and I am FINE with that :). Try to find the humor in my writings and you might be less offended :). Pankies is spayed but Barque is looking for a man to love. I like poodles and border collies too. Both spectacular breeds. (I can’t IMAGINE what the combo would give you.) And I think is a legit and good and interesting question to consider: What about breeding specifically for our current needs and pleasures? Why not? And why would you have given that notion a cutoff date? Of course a cut off date is absurd! It is ridiculous. Of course I was being intentionally hypocritical when I said I want to breed a Poodle to a BC but didn’t care for Labradoodles. Well now I know! However, while you may be joking around playing devils advocate… other people are using your words as if they were written in stone or the Bible and have already gone out into the world preaching with your encouragement to burn every labradoodle they see at the stake… so to speak. I added quite a bit to this blog to answer some questions I received. I don’t have any problem with mixing of breeds to produce a dog for a specific task. However, I guess I just don’t see how breeding a poodle to a border collie would produce a better sport dog for any sport. What is your reasoning? First and foremost, dogs of all breed types breed naturally. Genetically they are the same species. With that said, and the re-iteration that all of our breeds are just that, a result of cross breeding, people will continue to to test the results. I am an owner of my third labradoodle (had many all americans and pure breeds) and just am hooked with the temperament, sports ability and the fact that I haven’t had bronchitis since ownership. My beef is the person that crates a dog more than it is out, talks down another’s partner, does not do research before the purchase. People support rescue dogs in agility but not all americans? It is not the dog but what happens. Let us not become too enchanted in our love of dog(s) but love all dogs. Thank you for writing this, Helen. Those of us who responsibly breed, health test out the wazoo, invest countless hours researching dogs and pedigrees, and pour our hearts into raising amazing puppies, who may or may not be intentional mixed breeds bred for sports, appreciate it. Sorry for the super-long sentence! There are certainly people who breed mixes very well, and are every bit as responsible as the best of the purebred breeders. I find most of the purebred breeders incredibly closed minded, and absolutely ignorant of the effects that a closed stud book has on their population, and a complete lack of understanding of genetics beyond what is required testing for their breed. As for the trainer Sherri having issues with breeding them for particular sports- why is that more of an issue than with purebreds? Any idea of how many BCs, Aussies, etc are bred for sports, and many don’t have the structure or temperament to handle that sport? Its the same issue, don’t single out mixed breeds for that. While there are certainly mixes whose conformations don’t seem to blend well (I doubt a poodle and BC cross would be a good one for that reason) when looking at the genetics of various disorders, mixed breeds come out ahead. They’re still at risk, all dogs are, but are less likely to get some disorders, and equally likely to get others- but not more likely, unless you look at being hit by a car or developing a CCL tear, not a genetic issue, but one most likely related to spay/neuter status. As for the statement about mixing two breeds with health issues- hello, do you seriously think (you probably do but need to learn genetics) that the purebreds of those two breeds will be healthier? Overall health is also likely to be improved, as mixes have been shown to have increased longevity when compared to same size purebreds, when access to vet care is controlled for. Canine Companions mixes Labradors and Goldens for their program. They want the work ethic of the Lab and the personality of the Golden. At one point their head trainer was against it because he felt you couldn’t be sure what you were going to get. I love labs and agility is just a game to play with them so other then going out of the country to get a field type for my new partner, I cant say I advocate X breeding for a particular sport.The success rate for service dogs is only around 40% and they do tons of research before mixing. My first agility partner was one of their crosses. He was released for having an “unreliable work ethic”. Boy did we have fun.!! I’m sorry, but whoever thinks there is such a thing as careful breeding of a mix is ridiculous, you are literally playing god without any concept of results. You can not take out genetic problems by mixing two breeds that are genetically disposed to health issues. Kim, you seriously need to walk away from dogs if you think mixing a border collie and a poodle serves any purpose what so ever. The fact that you think its appropriate to “mix up” the breeds shows you have no understanding what so ever about breeding dogs. ‘There is no such thing as carefully mixing breeds. If you don’t like the breed you have, then go get a breed that serves the purpose you want. Quit screwing with the breeds and supporting breeders who do this. We have enough breeds already that take care of just about every single job that is out there. That goes for all breeds! They all came from mixes. Do you not know that thoughtful, purposeful crossing of different types of dogs is how all breeds were created in the first place? How ignorant can someone be! Do you think our modern breeds sprung forth fully formed from the mind of God himself, or something? Sheesh. “You can not take out genetic problems by mixing two breeds that are genetically disposed to health issues.” Someone needs to brush up on their reproductive biology. Oh Brian, but where do breeds come from then? A think you should come up with a borderpoo! Although I would prefer Sonic x Spit for size! I actually think it a good idea to carefully (carefully) mix breeds! The gene pools of some breeds could stand a little shaking up! Really? Like which breed? The border collie, no thank you, leave my breed alone, go screw with your own breed, hopefully its not a border collie. I hope you get nothing but mix breeds cause you don’t need a pure bred to screw with. You don’t know what ‘pure bred’ even means. It doesn’t mean ‘pure inbred blood’ from only a single line of dogs for ever and ever (all that leads to is disease and failure over time, as many purebred dogs now display). Do you even know how purebred animals are even maintained in other animal breeding cultures? Outcrossing for a purpose is considered totally normal in every one except dogs, where people seem stuck in the genetically-ignorant 19th century! And yet, all those other pure breeds manage to keep preserving their type and unique traits, go figure! All dogs (even border collies) were refined though intelligent infusion of blood from any capable dog that could do the job. Breeders with a trained eye who kept careful pedigrees set breed type and drive by their own choices. For border collies, it was how for superior herding ability. For sport mixes, it is for whatever job their breeder wants them refined for. There is nothing ‘morally superior’ about breeding dogs for sheep trials vs any other sport. You can responsibly breed for any purpose, even ‘simply pets’. Intelligent selection from various sources is how all dog breeds were created. Only a hack thinks he needs to keep inbreeding forever within a small gene pool or else he can’t keep type or quality in his lines. Just look up the ‘Boxer Outcross’ project and see how someone who actually knows how to selectively breed dogs can bring perfect type back within only a few generations, while keeping the new traits he wanted to add to his breed. Inbreeding and closed registries are a crutch. The incredible small-minded bigotry displayed by so many ‘pure bred’ dog breeders testifies to how widespread ignorance of basic dog history and genetics is among these so-called ‘experts’. Pai you are SPOT ON!!!! “My breed.” Oh, so you own it? Where’s your patent? That phase smacks so much of a need to possess and control. Chill dude. There will be plenty of border collies around. Crossing some is no crime. You may even learn a thing or two about old school breeding; when people were more about what the dog could DO for someone, than about the image of their set of dogs in their minds. I was pleasantly surprised after talking with you this past summer about my sports mix. She was carefully bred, from carefully screened parents and came from some of the best people anyone could hope to get a dog from. I was expecting to catch a lot of heat for my choice of dog, but you really impressed me. Thank you for sharing these thoughts with the public. The reality is, my sports mix IS high drive and high energy, when I need her to be. She also has an amazing off switch and is quite lazy in the house. Her structure is solid and she does her job well. I looked at purebreds and shelter/rescue dogs, this was the best fit for my family and my lifestyle at the time. I know trainers out there have had to deal with some of the “fall-outs”, but I really have to wonder how many of those came from the type of responsible breeder I chose to get a dog from. There is no way my breeder would allow the dogs to go to an inappropriate home and she ensures that they are care for their entire lives. Seriously, how different is it getting an ill-placed sports mix from a crummy breeder or a purebred terrier type that was placed in the wrong type of family. There are bad breeders and bad placements, no matter if it is a purebred or a mix. That is exactly what I was saying about wrong placements. It should only be done by someone who really knows what they are doing and where the dogs will end up. Yes, it is like any breeder; there are horrible crappy, great and everything in between. I only support the great ones. Well said VLM. What sports mix do you have? She is a Staffordshire Bull Terrier/Borderjack (Border Collie/Jack Russell). While I got her for Flyball, we have taken up agility and are looking at other sports as well. Her work ethic, with a great off switch can’t be beat. Helen, I completely agree and I have written about it many times. All dogs are mixed breeds, that is how they got to looking so different from one another. My problem with the whole “doodle” and other mix thing is the people who are doing it. Not all, but most are doing for a buck “the in thing.” We humans will buy anything that is new or rare. Same goes for our breed and all the popular and rare colors. The trainer in me has issues with dogs being bred for particular sports. I’ve had to deal with some of these as follow-out ones who didn’t quite make the cut. Again, it falls on the breeder to make sure that these highly driven, non stop energizer dogs do not end up in an unsuspecting families hands. There are many people who shun the mixed breeds and dogs gone wrong when in fact it is the humans that have gone wrong. There are so many breeds created for specialized hunting styles or looks that have no real purpose outside of their founders’ personal preferences. How is creating new breeds/type for modern dog sports any less respectable? Dogs have evolved along with human society. 200 years ago, so preserving these old, specialized breeds for jobs that nowadays are in decline or obsolete is a vanity done for personal enjoyment. Nothing wrong with that, either, as long as they are bred responsibly. Sport dogs have just as much right to be refined as any other type of dog created for a job, imo. Nina, what do you mean by the worst of both breeds, when you say “most” get the worst? And how do you know most people do? Where are you getting that info from? Just curious.